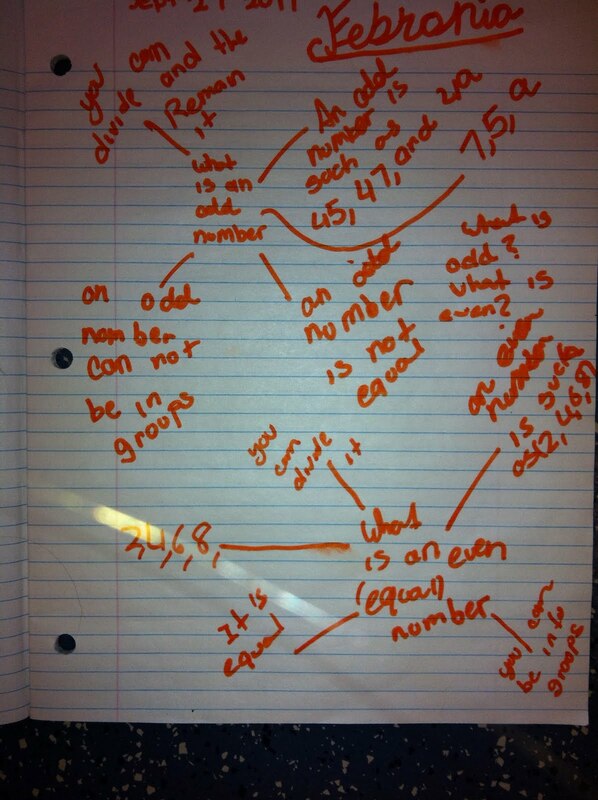 Wow, we have had two days of powerful math happening in our classes. 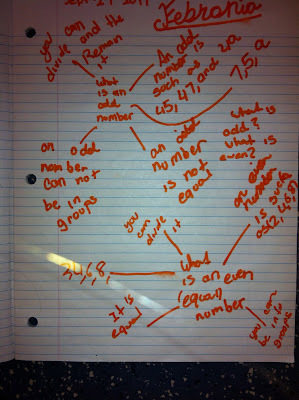 As per our last discussion, we gave each student a 100s chart. We began by asking students to colour in all of the multiples of one. To our surprise…most kids had no idea what we were talking about. In fact, many confused looks were exchanged among the students - and us, as we realized that few kids knew where to start. Then the magic began…students started making conjectures, they began supporting and refuting others' conjectures, they were talking about abstract concepts and began developing an in-depth understanding of the concept being discussed. The light bulbs were going off. Misconceptions were discussed and partial truths were reworded to become complete truths. We discovered new definitions and new ways of thinking. It was powerful. We captured a great deal on video and we took several photos. The discussion today was based on the question "what is a multiple of 2?". 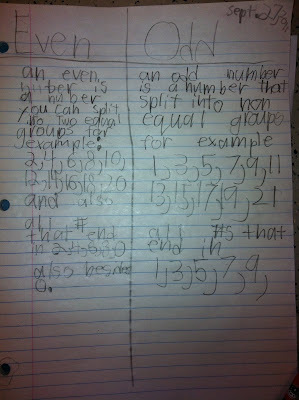 The first picture is the kids initial ideas, the second picture is their refined/reworded conjectures. The last 2 pictures are of students individual journals, where we asked them to define "even" and "odd". This is evidence of powerful mathematical learning happening. It was powerful for teachers, admin (who popped by) and for our students. Although it seems rudimentary, we believe we are setting the foundation for solid mathematical reasoning, establishing conjectures, working through the conjectures to find truths, and discovering that their is not just one way of "doing" math. I learned more about math yesterday than I think I might have in all of Elementary. It was fascinating. I was particularly intrigued by a series of "Rightbrainmath" videos by Mr. Numbers which visually demonstrated the patterns which result from multiples. I felt pretty excited about Math Conference today. We started by handing out number sheets and asking the kids to color in multiples of one. It became apparent immediately that none knew where to start, so rather than instruct we introduced the idea of "mathematical conjectures", ideas about what something might mean which might prove to be incorrect, partially true or completely correct. 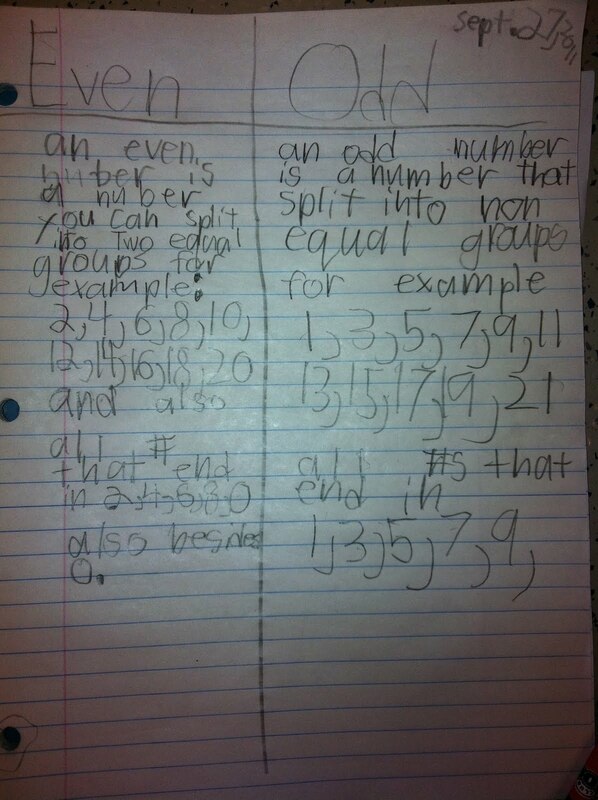 The kids volunteered conjectures on definitions for multiples of one. Initially, we had suggestions which included "any number with a one in it" and "every second number from one to nine". You're invited to come learn with us! In the next month we are hosting 2 Professional Development Networking Days. The goal of these days is to bring together teachers of a particular subject to share ideas with time to plan projects for the year. Also, these days are a chance to broaden our PD networks and build relationships that can extend beyond the day. Last year we tried this with two subjects, Phys Ed and Fine Arts, and both of the days went really well. This year we are hosting two more, Phys Ed and Social Studies (Grades 6, 8 & 9 only). There is no cost for either day. The PE Networking Day is on Wednesday, September 21st. You can register here. The Social Studies Networking Day is on Wednesday, September 28th. You can register here. Update: After only 24 hours we have 10 signed up for each. Make sure you sign up quickly! On both days, CSS will organize a pizza lunch for those interested. Please bring $10 cash per attendee to cover this cost. You can also feel free to bring your own lunch. We feel that much of our work as PE teachers is in isolated and unique situations - whether it is the actual physical building, the location of our school, the mandate/philosophy of our respective schools and so on. We also feel that each of us possesses experience and teaching resources that might be of benefit to other PE teachers. We are viewing this day as a way for our PE teachers to share what they do in their PE programs and how they do it, as well as a way for our teachers to create a professional network. The Calgary Science School will host this event; however the purpose is to allow for presentations from any attendees. Presentations can range from particular approaches to PE units, coaching, to healthy school initiatives, etc. Or it could also be as simple as an overview of the unique situation and challenges your particular PE program faces. Teachers could also bring issues or problems they are currently facing, using this networking day as a way to receive assistance or spark discussion amongst the attendees. Again, the purpose of this day is to share elements of our practice and in return, leave the day with new resources and contacts. Regarding the presentations, we are hoping that a number of attendees will present for 20 - 30 mins. We have facilities for both active (demonstrating a particular game or technique) as well as lecture/discussion (Powerpoint, etc) style presentations. We will provide projectors and internet access for those who require it. You can register for the PE day here. The networking day for Social Studies is limited to grades 6, 8 & 9 because we feel these grades share a common focus on more abstract conceptual understanding (government, democracy, worldview) as compared to the more historically focused 4, 5, and 7 curriculum. Also, we are limiting this to grade 9 because of the grade range of our school, 4-9. 1) Developing Active Citizenship. The day will start with a presentation and discussion led by one of our teachers, David Scott. Over the last few years, David has become increasingly interested in structuring his social studies classroom around active citizenship, specifically trying to connect the program of studies to current topics which provide opportunities for students to redesign or impact their world. This includes discussion on the potential of emerging technologies in fostering active citizenship in students. While David will share his thoughts and some classroom examples, but the goal is to foster discussion with participants around this topic. 2) Sharing and Collaborating. The remainder of the day will be made available for teachers to break off in small groups focused on specific grade levels. We see this time used for sharing projects, ideas, and technologies - directed toward increasing our emphasis on active and engaged citizenship for students. You can register for the Social Studies Day here. If you have any questions or comments, you can email Calgary Science School PD Coordinator Neil Stephenson here.